We understand that each person living with us has distinct needs. Our dedicated carers spend time getting to understand the complete needs and desires of each of our residents and work to provide opportunity and choice that empowers residents to take control of their life decisions. What is dementia and dementia care? The term “dementia” is used to describe the symptoms that occur when the brain is affected by specific diseases and conditions. It is a progressive condition which each person experiences in their own individual way. Symptoms include loss of memory, confusion and problems with speech and understanding. At Mayflower Court we recognise that each person is an individual with unique needs, a rich history, different experiences, abilities, preferences and personalities. We recognise the symptoms of the illness and accommodate them in our approach, we look for opportunities to build on the individual’s strengths and find ways to compensate for the losses brought about by dementia to ensure the best quality of life. By responding to the individual and supporting what they can do with a personalised dementia care plan, our approach respects the uniqueness of each person rather than focusing on the diagnosis of dementia. At Mayflower Court our carers are trained in completing detailed care plans with the help of residents, their family, friends and their life story. These plans are used daily and help to maintain the identity and dignity of the person as the dementia progresses, providing important information, such as how they like their cup of tea. We ensure our services reflect best practice of dementia care in Surrey. All of our carers are trained and supported by our dedicated dementia team to ensure residents feel valued and able to live life to the full. Our team are always ready to offer support to family and friends with access to information and advice about living with dementia. Find out more about our team on the right people page. We offer dementia care at Mayflower Court in a specially adapted environment that has a number of features to help our residents enjoy their new home to the full. 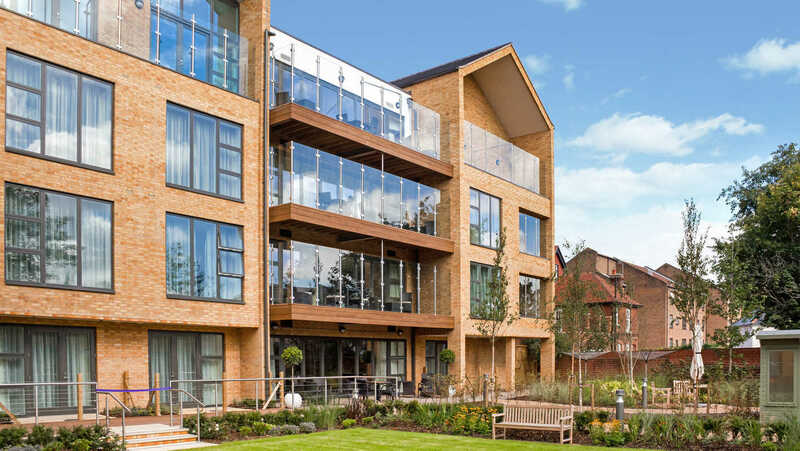 The design and layout of the building helps residents to familiarise themselves with their new home, while the interiors are designed to create a safe, calming environment for our residents when they go about their day-to-day activities. As a result, we aim to maximise a person’s independence and enhance their self-esteem. Our residents have the opportunity to move around safely in their home. They are supported in this by the use of defined areas and appropriate signage that is clearly worded and pictorially illustrated, enabling residents to orientate themselves. Considered use of colour contrast helps make our buildings understandable to those with impaired memory and high levels of anxiety. Mayflower Court offers both lively living spaces and places for quiet reflection. We also have fireplaces in lounges which reflect a family home environment and large windows which give plenty of natural light. At Mayflower Court we understand the importance of access to the outdoors, as it provides the opportunity for exercise, fresh air, relieves tension and anxiety and offers personal space for reflection and privacy. Being outside stimulates the production of vitamin D, helping to maintain healthy muscles and bones. It also offers stimulation in the form of different colours, textures and natural smells and sounds. Spending time outside in a garden has been shown to positively affect a person’s emotions and to improve their sense of well-being. 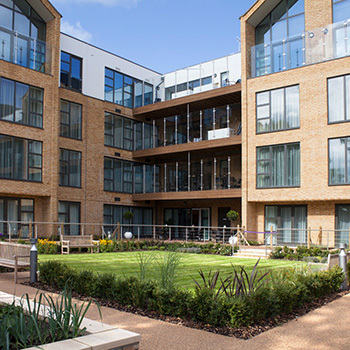 Our safe and secure gardens at Mayflower Court are a pleasure to explore and have been carefully landscaped to make them interesting to walk around. Being outside is also a great way for residents to observe the changing seasons. 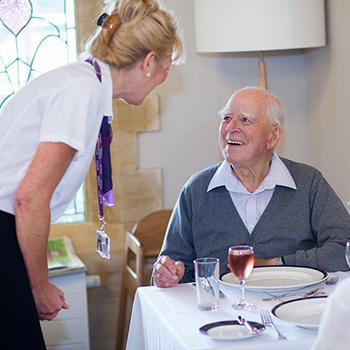 Mealtimes are a great opportunity for social interaction and involvement at Mayflower Court. Our carefully considered menus offer healthy, tasty and nutritious choices every day. Find out more about how we make the most of mealtimes at Mayflower Court. Strong relationships are fundamental to everyone’s happiness and well-being. These relationships can be more difficult for a person with dementia to maintain as memory and communication skills diminish. Maintaining close bonds with families and loved ones is actively encouraged at Mayflower Court, visitors are most welcome any time and can join residents in activities and for meals. Our team are happy to answer questions about dementia any time and can also offer support, information and advice to relatives of our residents.